Organic mulches break down quickly in warm, damp environments and may even begin to harm the plants they were meant to foster. Using a rubber mulch can provide many, but not all, the same benefits without being constantly replaced. One needs to consider the cons of rubber mulch and its potential toxicity before adding it to their landscape. 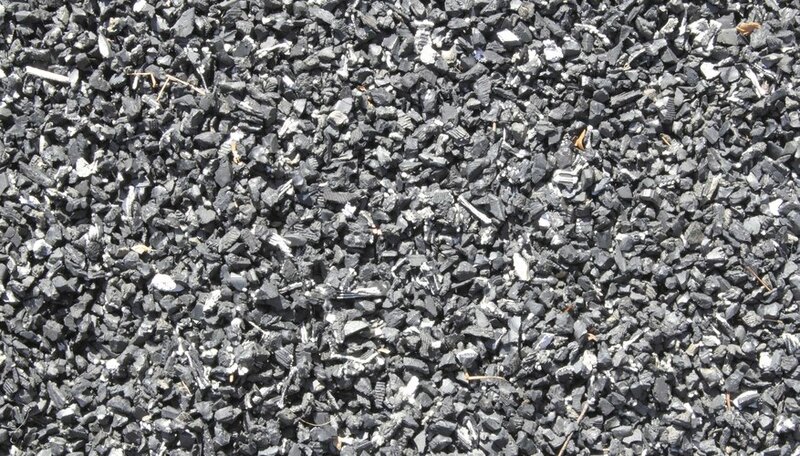 Rubber mulch is commonly made from recycled rubber taken from tires and other sources and shredded to reduce it to the proper size. Rubber mulch provides the same physical benefits of traditional organic mulches. Adding a layer of rubber mulch improves moisture retention in the soil and decreases the growth of weeds, though it hasn't shown to be as effective in controlling weeds as organic options. Rubber mulch is also heavier than most organic mulches, making it less susceptible to being blown or washed away. Rubber mulches are available in many colors and are designed to retain their color without fading longer than artificially colored wood mulch products. Rubber mulch does decompose but at a much slower rate than organic mulches; rubber mulch does not encourage the growth of harmful microorganisms in plant beds. Organic mulches require regular replacement as they decompose. Although the decomposition process shortens the longevity of organic mulch it also enriches the soil with nutrients and improves its structure when tilled into the soil on an annual basis. Rubber mulches do not break down as quickly as organic-based mulches but they do not improve the soil and are typically much more expensive than regular organic mulch. It is also more difficult to remove rubber mulch from garden beds than organic types. Rubber mulch is not permanent; microorganisms in the soil cause it to decompose over a long period of time. As it breaks down, rubber mulch releases up to 11 types of metal into the soil in addition to any contaminants absorbed by the rubber before it was recycled. The most problematic metal in garden beds that decomposing rubber mulch releases is zinc. The zinc comes from the tires used to create rubber mulch, which consists of up to 2 percent of the tire's total mass. Over time, rain and irrigation water can leach zinc into the soil, increasing the concentration of the metal to a level that is harmful to plants, aquatic life and potentially to humans. According to Washington State University noting a USDA study and the toxicity of rubber mulch, the product should not be used in composting, potting mediums or used in garden soils or agriculture. Shredded rubber mulch is a poor choice for gardens or landscapes in areas that are prone to wildfires. Once ignited, rubber mulch burns hotter with a higher flame than fires in other types of mulch. Most common types of organic mulch are susceptible to fire in hot, dry conditions. The University of California recommends keeping rubber mulch and other combustible mulches at least 30 feet away from homes. Using inorganic mulches made from gravel or brick chips is an effective way to mulch flower and garden beds near homes in areas prone to wildfires.